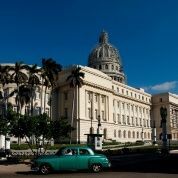 April 18 (teleSUR) Cuba’s new national assembly of 605 representatives recently elected in the popular democratic March 11 election met Wednesday April 18 to choose the next president, first vice president, five vice presidents and 23 members of the State Council. Cuban elections are scarcely covered by western media, while detractors of the island’s economic system insist on the undemocratic nature of its government. For over five decades, successive U.S. governments have maintained a brutal economic blockade under democratic pretenses. However, the genesis of the measures tells a different story. They were imposed in 1960 after the Revolution took power and a process of expropriations began. Thirty years later, in the 1990s the U.S. government decided to reframe the blockade through the Cuban Democracy Act. The act stated sanctions would remain as long as the Cuban government refused to take steps towards democratization. This shift signals to the underlying belief that “market freedom” is equal to political freedom. In the late 1990s Nobel Peace Prize laureate, economist Amartya Sen sheds light on the relation between self-determination, which includes political freedom and freedom from want. Freedom of agency it is argued is inescapably constrained by available social and economic opportunities. If constraints on social and economic opportunities reduce freedom of agency, then inequitable economic models must undermine democratic arrangements. Democracy, the government of the people, is incompatible with economic models that concentrate wealth through destitution which reduce a people’s capacity to govern themselves. Neoliberal measures such as privatization, which restricts access to services required for the fulfillment of human rights (i.e. education, health, water), and market liberalization that can decimate national industry and jobs stymie freedom from want. However, in the Americas there seems to be room only for neoliberal democracies. A government that protects its industries, nationalizes its resources and allows more social spending to the fulfillment of basic rights is more likely to be labeled undemocratic. Thus, we have today shining democracies where social leaders are killed with impunity like in Colombia, or where a criminal against humanity is granted a pardon like Alberto Fujimori in Peru, or where police brutality claims the lives of its citizens like in the U.S.
Again, market freedom has been confused with political freedom. But democracy is not a label, it is a process. As such, democratic arrangements should be analyzed within the historical context that produces them measuring whether they have progressed to allow more direct participation or regressed, restricting participation. Differences between the electoral systems in the U.S. and Cuba reveal that while one has further restricted participation, the other has expanded it. All modern states are representative democracies. The people do not govern themselves but elect representatives to do so. In the U.S. the restrictive character of electoral participation is determined first by the two-party system, which determines that the state legislature is dominated by two parties, the Democratic and Republican parties. Those who will appear in the presidential and legislative ballots are chosen in party primaries, in which, in many cases, only registered democrats or republicans get to vote. Less than a third of the U.S. population is registered either as democrat or republican. Thus, a minority of people choose who people can vote for. In Cuba, it is not the Communist party but rather the Municipal Assemblies together with civil society organizations (including the Women’s Federations and the Worker’s Federation) that nominate the candidates to Cuba’s National Assembly. Cubans, with or without party affiliation, nominate and vote directly for over 12,000 delegates to the 168 Municipal Assemblies in highly participatory local processes. The nomination process occurs within popular assemblies at neighborhood meetings, and unlike Cuba’s detractors would have us believe, candidates, are not necessarily members of the Communist Party. Last year, an opposition coalition Other18 ran at least 160 candidates. They weren’t elected, but they were free to participate. Cubas electoral system is not based on party participation, a fact interpreted by the U.S. government and political analysts as a sign of restricted political freedom. However, any person can run for the Municipal Assemblies, and later be nominated by the National Assembly. The governing bodies of the two main parties in the U.S., the Democratic and Republican National Committees owe themselves to those who enable them to support their candidates’ campaign, further restricting who gets to participate. “A Senate seat, on average, costs $10.5 million and a House seat $1.7 million. There are powerful incentives for politicians to pay attention to wealthy donors – electoral survival, to start with… It does not seem an intellectual stretch to conclude that, when the political and economic winners collude to dominate politics, the concerns of ordinary people will not be at the top of the agenda.” Gallucci explains. This reality worsened by the 2010 U.S. Supreme Court Ruling Citizens United, which allows limitless spending by corporations and other private actors on political campaigns. In contrast, in Cuba there are no millionaire campaigns. Campaigning for the members of Municipal Assemblies is reduced to the essential: a presentation of the candidate’s individual profile highlighting their qualities and capacities to represent their constituents. All of the candidates’ profiles are publicly posted so voters can inform themselves. In Cuba and the U.S., the president is elected indirectly. Last year Donald Trump was declared U.S. president after losing the popular vote by over two million votes. It is not the people of the United States who chose their top representative but rather a group of “representatives” or electors from each state. Something similar happens in Cuba, where the president is not elected by popular vote but rather by the Council of State, which is formed by the National Assembly. The difference is that while at the very bases of the democratic process in Cuba there are direct local elections, in the U.S. this process is dominated by two parties with their own economic interests and power dynamics. In the U.S. the electoral college system determines that more populated states have more electoral votes, but many states have a winner-takes-all policy, which means that if a candidate wins the majority of the popular vote in a state like Ohio, those who voted for the other candidates lose their voice in the electoral vote. This means silencing millions of people who voted. This could not happen in Cuba because every 300 to 2,000 people form a district and every district gets at least one delegate in the Municipal Assemblies. According to a Gallup poll, at least 49 percent of the U.S. population supports amending the Constitution to abolish the electoral college. Surely, within Cuba, there are people who oppose the existing electoral system but so far they seem to be few given the high level of voter participation in the Island. In many states, people who are not registered Democrats or Republicans cannot vote in primaries. In general elections, U.S. citizens 18 years old and older need to register in order to vote. According to official sources, registration deadlines could be as much as a month before an election. This requirement doesn’t exist in Cuba, where all citizens and permanent residents over the age of 16 are automatically registered to vote. In both countries, the political rights of people convicted of felonies are hampered. In Cuba, convicted criminals cannot vote, while in the U.S. only in two states felons do not lose the right to vote. Among the restrictions are the requirement of a photo ID and documented proof of citizenship when registering to vote. Photo-ID voting laws have been challenged by a high court in at least four U.S. states, and in at least two they have been challenged for disproportionately targeting Latinoand African American voters. Furthermore, most people who live in poverty do not have passports or driving licenses, the only two forms of photo ID. Voting in both countries is not mandatory. However, while the U.S. has a very low voter turnout that oscillates around 50 percent, in Cuba voter turnout remains above 90 percent. If we look at participation in the electoral process, we can see that while the U.S. has progressively limited who can be elected and who can elect their representatives, Cuba has different mechanisms to ensure popular participation both as electors and candidates. The U.S., which considers itself the greatest democracy in the world, has a rather dysfunctional and restricted democracy that should make its representatives think twice when labeling other political systems as undemocratic.